The flag of Erciş (photo, photo) is white with the municipality's emblem. "T.C." stands for "Türkiye Cumhuriyeti", "Republic of Turkey"; "Belediyesi" means "Municipality". The former flag of Erciş (photo, photo) was white with the municipality's emblem. "T.C." stands for "Türkiye Cumhuriyeti", "Republic of Turkey"; "Belediyesi" means "Municipality". The emblem was soon changed because it was very similar to the emblem used by Cihanbeyli (Konya). The former flag of Erciş (photo) was white with the municipality's former emblem. "Belediyesi" means "Municipality". 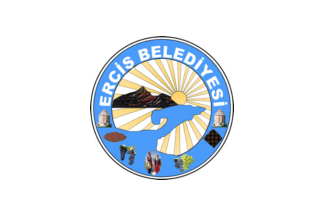 The flag of the Erciş district government (photo) is white with the municipality's emblem. "Türkiye Cumhuriyeti" means "Republic of Turkey"; "Kaymakamlığı" means "District government".